I want to eat Tendon! 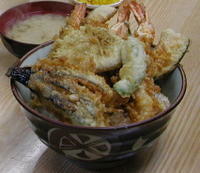 I've made tempura before. We took different kinds of vegetables, dipped them in ice cold flour batter and deep fried them for a few seconds. Wow yummy! We dipped them in a few kinds of sauces and had them with sake. I am a 1,000th visitor!!!!!!!!!!!!!!!!!!!!!!!!!!!!!!!!!!!!!!!!!!!!!!!!!!!!!!!!!!!!!!!!!!!!!!!!!!!!!!!!!! Congratulations:D!!!!!! You always read my blog:) Thank you so much:D!!!! Yeah! !